Movie Guide Unabashedly sentimental, this war film was produced by David Putnam in partnership with Catherine Wyler, whose father William Wyler directed an acclaimed documentary about the real-life events depicted in the film. Experience the American Journey through our country's visual heritage in this historical recording provided by the National Archives of the United States. 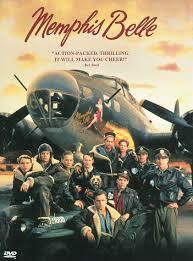 Documentary: On the Memphis Belle: a Boeing B-17F Flying Fortress, and the first American bomber and crew to complete twenty-five missions over enemy territory in World War II. Highlights the mission to Wilhelmshaven: ground crew duties, flight crew briefing, and the elaborate plan of coordinated raids intended to fool the enemy. After the Memphis Belle returns, the Crew receives the Distinguished Flying Cross and are visited by many dignitaries, including the King and Queen of Great Britain. Views of B-17's in flight, being shot down, crews bailing out of burning bombers and air base activities. From the Office of War Information. This historical recording from the National Archives may contain variations in audio and video quality based on the limitations of the original source material. The content summary for this documentary is adapted from an historical description provided by the government agency or donor at the time of production release.